Action from Spalding United's (blue) 1-1 draw with Rugby. Photo: Tim Wilson. Prolific marksman Dan Cotton’s brace moved him to the top of the United Counties Premier Division scoring charts, but it still wasn’t enough for Yaxley to secure victory over lowly Rothwell Corinthians at In2itive Park. 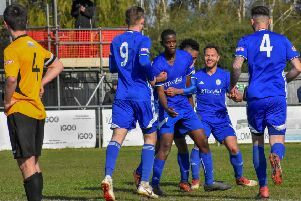 Cotton’s double made it 27 Premier Division goals for the season - he has 33 in all competitions -, the same as Deeping Rangers’ striker Scott Coupland, but the visitors came from behind twice to claim a point from a 2-2 draw with the final goal arriving in added time at the end of the game. Yaxley remain stuck in the middle of the table, three points behind Wisbech Town who stretched their unbeaten run to eight matches with a 4-2 success at Oadby. Adam Millson’s penalty, two goals from Matt Sparrow and another from Jon Fairweather saw ‘The Fenman 4-0 up with an hour gone. Peterborough Northern Star emulated Peterborough United by carelessly throwing away a 2-0 half-team lead at Harborough. Star looked set to record back-to-back wins after goals from Luke Smith and Callum Madigan gave them the edge at the break. The games involving Holbeach United and Deeping Rangers were washed out, while Huntingdon are certain to finish bottom after losing 5-0 at home to fellow strugglers Sileby Rangers. In Division One, the champagne remains on ice for Peterborough Sports who went down 2-0 at nearest challengers ON Chenecks. A goal in each half did for the city side who failed to score in a league game for just the second time this season. Sports’ star Josh Moreman was one of two players sent off in a hard-fought game as the city side fell behind to 10 men after Olly Medwynter had conceded a penalty. A Chenecks player was dismissed for throwing an elbow in the face of Mark Cox causing an injury that eventually led to the defender leaving the field with an eye injury. Moreman walked soon afterwards following a scuffle at a corner. A win would have all but secured promotion for Sports, but their consolation is a massive 15-point lead at the top with just eight matches to play. Blackstones crushed Olney 6-1 at London Road as Addie Staffiere grabbed a hat-trick, Matt Cook scored twice and Matt Simpson completed the scoring. Stamford AFC’s lead over the Evo Stik Northern Premier Division relegation zone is down to just one point after a 3-1 defeat at Buxton. Jake Newman dragged the Daniels level early in the second-half, but a two-goal spell in just four minutes for the home side sealed the win. Stamford now face a big home game at the Zeeco Stadium on Tuesday (March 15) when second place Darlington1883 are the visitors. Spalding are now six points off the play-off places in Division One South after drawing 1-1 at home to Rugby. Dan Banister fired the Tulips in front in the first-half before the visitors equalised 10 minutes into the second-half. A miserable week for March Town United ended with a 3-1 defeat at Braintree Reserves in Division One of the Thurlow Nunn League. Liam Merryweather scored the March goal from the penalty spot before ‘The Hares’ had Matt Cox sent off for serious foul play in the final minute. Postponed: Leicester Nirvana v Holbeach United, Wellingborough Town v Deeping Rangers. Blackstones 6 (Staffieri 3, Cook 2, Simpson).